On May 6, 1978, the ABC Weekend Special aired a version of The Puppy Who Wanted a Boy, a children's book by Catherine Woolley about a young dog who attached himself to a lonely orphan boy named Tommy. Over the next four years, The Puppy and its three sequels, which used various actors’ voices for Petey the puppy, were repeatedly shown on the Weekend Special. In 1982, Petey could at last be seen weekly as the second half of The Scooby and Scrappy-Doo/Puppy’s New Adventure Hour. From here on out, Billy Jacoby would voice Petey and Nancy McKeon (The Facts of Life's Jo) would voice his puppy friend Dolly. The following year, the show played solo as The Puppy’s Great Adventures. 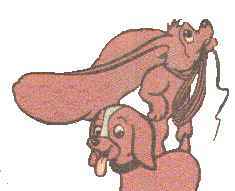 Petey and his other canine buddies Duke, Dash and Lucky looked for Tommy's lost family each week until the series came to an end in 1984. However, two years later, the cute canines were brought back for reruns on CBS.